HIAS 2018 will be held from 19 - 21 November 2018 by the Department of Nuclear Physics at The Australian National University, Canberra. The first scientific sessions will start early on Monday 19 November. Note that the University is approximately 15 minutes by taxi from Canberra airport (fare is ~ AUD$30). The conference will close late-afternoon on Wednesday 21 November. The venue for HIAS 2018 will be in the Finkel Lecture Theatre, John Curtin School of Medical Research (JCSMR), Building 131, Garran Road, The Australian National University (JCSMR map), an approximately 5 minute walk from the accommodation locations at University House and Liversidge apartments. 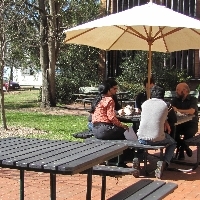 The Department of Nuclear Physics (map) building is adjacent to JCSMR in the south-west corner of the University, and will be the venue for evening meals. University House (map) and Liversidge appartments (map) are located on the south-east side of the University. Walking and cycle paths provide good access to the city centre, Lake Burley Griffin, the Australian National Botanic Gardens and the National Museum of Australia, which are all within 2 kilometers of the department. Attendees are responsible for booking their own accommodation. Attendees should note that block bookings of accommodation for the period 19 - 20 November have been set aside for attendees on the ANU campus at University Accommodation (apartments) and at University House (rooms). The block bookings comprises of a mixture of twin rooms, queen suites and studio, one and two bedroom apartments. 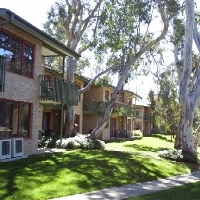 Costs per night range between AUD$155 per night for a twin room (second person in twin room may incur additional charges) to AUD$229 for a two bedroom "family" apartment. Breakfast packages may also be available for a small additional fee. This accommodation is limited and attendees need to book by 8th October 2018. When making a booking on the ANU campus please ensure the accommodation provider is aware you are part of the HIAS 2018 block booking by entering the keyword "HIAS2018" in the Additional Information/Message text box field. Note that cancellation fees may apply.